Abe calls for nuclear disarmament Jump to media player At the 70th anniversary commemorations of Japan's PM Shinzo Abe says it is the world's duty and responsibility to eradicate nuclear weapons. The tram that survived Hiroshima Jump to media player A tram that survived the Hiroshima atomic bomb attack blast, has now been restored. The pain of Hiroshima 70 years on Jump to media player On the eve of the 70th anniversary of Hiroshima, the BBC's special correspondent Fergal Keane has been talking to survivors of the nuclear attack. Hiroshima bomb survivor speaks out Jump to media player Keiko Ogura survived the Hiroshima bomb and has spoken out about it. A Hiroshima girl's story of survival Jump to media player Bun Hashizume was 14 years old when a nuclear bomb was dropped on the city of Hiroshima, Japan, over 70 years ago. Here is her inspiring story. Take a tour of Hiroshima's peace park Jump to media player Leah takes a look around the Hiroshima Peace Memorial Park in Japan, which is a place dedicated to all those affected by the nuclear bombing of the city during World War Two. Nagasaki POW recalls camp horrors Jump to media player A former Japanese POW tells how he survived slave labour in camps, being torpedoed by the Americans and the atomic bomb being dropped on Nagasaki. 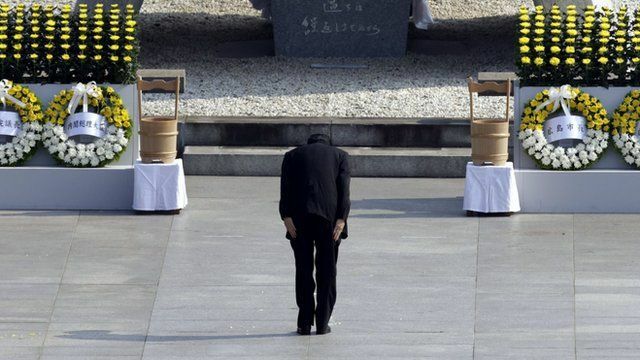 Residents in the Japanese city of Hiroshima are commemorating the 70th anniversary of the first atomic bomb being dropped by a US aircraft. Addressing the crowd, Japan's Prime Minister Shinzo Abe said that "we have to continue our effort to achieve a world without nuclear weapons, it is our responsibility and it is our duty."